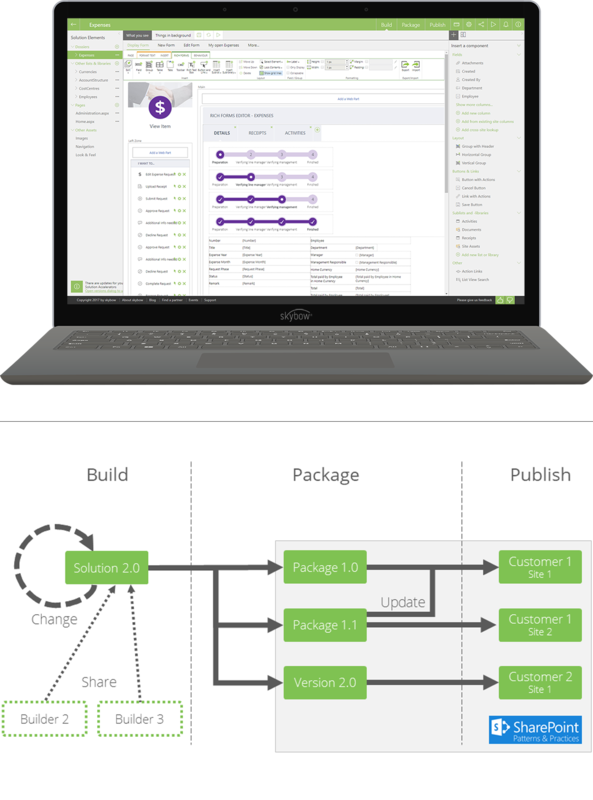 skybow Solution Studio: The no-code platform to build and manage Business Apps that don’t ask you compromise. Every solution typically consists of three parts, the user interface, business logic, and data storage. Solution Studio is designed to let you build the whole thing from one solution design environment. You can design lists, libraries, forms, sets of actions, pages, styling, images, and more — without moving from product to product. In particular, we've noticed most tools for SharePoint assume you already built and configured all of your lists and libraries. Well, skybow thinks that's an essential part of any solution -- so we take lists and libraries very seriously. The starting point of most skybow solutions is a dossier, or case file. So you can open one form and see everything about a given item across multiple lists and libraries. It's really a set of interdependent SharePoint lists and libraries that form one or more master-detail relationships. When you combine it with data aggregation and/or metadata inheritance, you can make the data automatically do work you used to have to hard-code into forms or workflows. Unlike most low-code/no-code tools, Solution Studio assumes you’ll want to developa solution in one place, possibl test it in yet another place, and ultimatel deploy it to yet another place for production usage. Oh, and that you'll want to make changes later and test/publish those, too. And even create a catalog of solution templates. We make those things easy -- really easy. We provide several templates to get you started, and you can create more. Anything designed using Solution Studio can be turned into a template. Sharing templates is easy. What's it like to build something with skybow Solution Studio? Design your schema. These can be standalone lists/libraries and/or something we call a dossier. A dossier is a set of SharePoint lists/libraries linked together to behave like a database. You can view a master list item and all related detail items like one complete case file. We do the linking for you. Build your forms. We'll actually help build them for you, including tabbed pages and master/detail lists. But you can take them much further from there. Build your actions. These can be links on a page, buttons on a form, or scheduled actions. They can trigger a whole set of instructions that take place as a set. Add extra functionality. Would you like totals to be calculated automatically? To generate a Word document containing all the content in a case file? To have custom pages, images, or Quick Launch links? You can do that, too. Add any assets. This can include images, pages, list item content, library documents, navigation links, style and theme configurations, and more. Deploy that release package to your test or production environment using one of several available methods, the easiest of which is little more than one click. What have people built with skybow Solution Studio? skybow Rich Forms is an integral part of skybow Solution Studio, and provides an easy-to-use, yet powerful editor to customize list forms. Building forms in SharePoint Online that look great and fulfill all your requirements of your forms has never been easier! 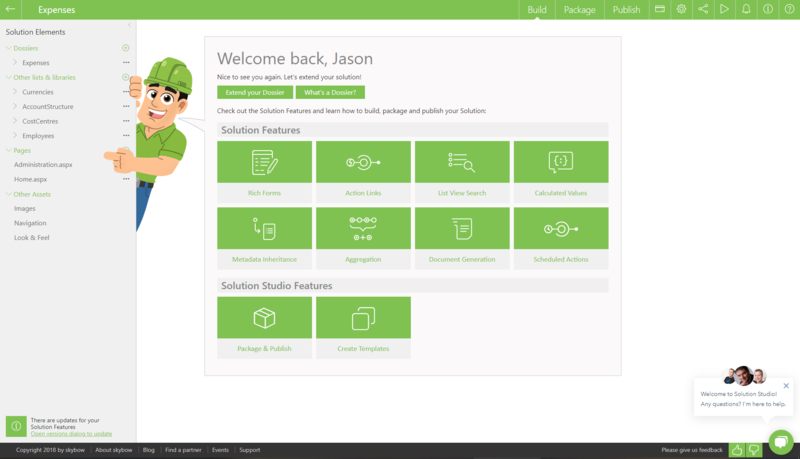 skybow Action Links are the integral part of Solution Studio, which enables you to easily implement even the most complex business logic into SharePoint Online with powerful actions. skybow List View Search is an integral part of skybow Solution Studio, which enbales users to easily find information in lists. Add skybow List View Search above any list or library view to provide useful search inputs. You can easily configure the underlying query, the columns to search in and the comparison to use. Optimize the search result and refinement possibilities of SharePoint by inheriting metadata to related documents and items from its superordinate element. Define multiple aggregation types (summaries, averages, maximums and minimums, count) across multiple lists and fields, usually in some kind of master-detail relations. The data is physically persisted in SharePoint lists and can be used as a part of any other calculation process. Generate documents based on standard Microsoft Word files filled with SharePoint list data by just one click. Just configure scheduled actions like a rule to plan automated executions with actions from a set of powerful action types.